The Day Trading INDU Model is a proprietary computer-based model that predicts the daily behaviour of the Dow Jones Industrial Average and the S&P500. Its forecasts are issued “market on close”, and are valid until the end of the following trading day. The INDU model is the product of 8 years of efforts by a team of former academicians and Ph.D. students from American and European Universities . It was completed in 1999. Its forecasts are based on a number of weighted technical indicators, whose trigger points vary as a function of a set of fundamental indicators. The Medium Term INDU Model issues unfrequent but reliable medium term signals to open and close positions, the average holding period being about 18 trading days. Buying options is the less risky way of taking advantage of its forecasts. The INDU Models have been tailored for derivatives trading. Futures and options are risky instruments and may be safely traded only by Hedge Funds, professionals or skilled financial traders. However, the INDU models are specifically designed to dampen the volatility of sequences of profits and losses - an essential feature of any successful futures trading strategy. 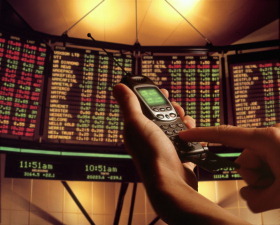 The models may also support individual stocks trading. Successful trading of individual stocks depends largely upon a correct forecast of the direction of the broad market: indeed, most people would be surprised to know that - historically - more than 75% of the volatility of individual stocks is "explained" statistically by index movements. The DTIM takes a position every trading day, either "LONG", "FLAT", or "SHORT", at the close of the NYSE (4:00 p.m., NYT, 15 minutes before the closing of the futures market), and holds it until the end of the following trading day, when a new signal is issued market-on-close. Statistically, the model tend to stay Flat about 20% of the times. The model does not issue "stop-loss" signals: however, such orders should protect traders from dramatic one-day losses. Since positions are held overnight, there is in any case no defence against huge adverse opening gaps. The Objectives of the Day Trading INDU Model are two-fold, coherent with the specific needs of futures trading: 1) Maximize profits 2) Limit the volatility of its gains and losses (and the dimension of negative sequences). Because futures are a highly leveraged instrument, the latter objective is most important. Profit maximization is achieved through both a maximization of revenues from speculative activity, and a minimization of costs. Revenues tend to be highest if the model issues a trading signal even when the probability of a winning trade is not very high above the 50% threshold. On the contrary, cost minimization (including transaction, communication and accounting costs) requires that the number of trades is not too high. The model tries to balance both sides of the equation and goes "Flat" when the probability of a gain and its expected dimension are very low. A "Flat" stance may thus reflect either the model's expectation of a dull trading day, or the model's extreme uncertainty about the DJIA's direction. Profit volatility is a crucial parameter: it affects not just the level of risk, but the level of profits as well. Contrary to most technical forecasting models which tend to concentrate their gains in periods of strong and sustained trends and their losses in periods of directionless markets -, the Day Trading INDU Model shows almost no tendency to lose (on average) in side-trends: this feature greatly reduces the dimension and length of negative trading sequences, thus lowering the volatility of profits along their upward path. The model, on the other hand, may miss parts of some powerful trends. The team has analysed the consequences of using "stop-loss" orders. The findings are the following: “stop-loss” orders reduce the daily volatility, the overall risk of the model (i.e. the dimension of negative sequences), the traders' psychological stress, and (slightly) the expected profits of the model. Loose stop orders (-1,55%) do not reduce profits significantly.